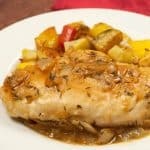 Bourbon, apple cider and a little butter make a fast, delicious pan sauce for boneless chicken breasts and apple wedges that have been roasted with a pinch of sugar and cinnamon. Serve with oven-roasted red potatoes and steamed green beans with lemon-butter for a complete meal. 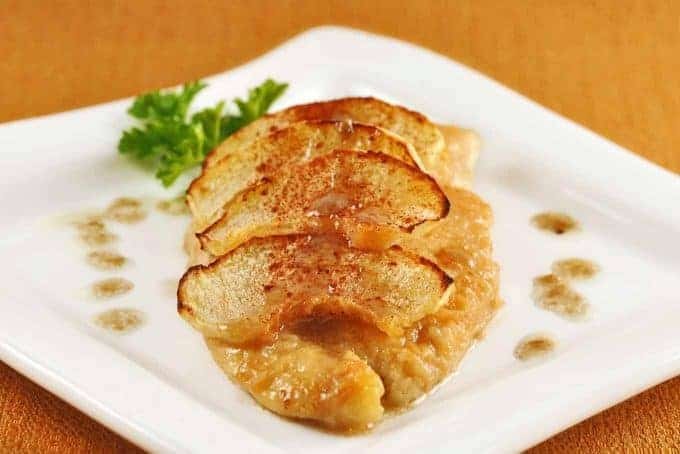 Boneless chicken breasts topped with roasted apple wedges and a pan sauce made from bourbon, butter and apple cider makes a quick and delicious main course. Preheat the oven to 400°F and line a baking sheet with parchment paper. Arrange the apple wedges on the sheet and sprinkle with the sugar and cinnamon. Roast for about 12 minutes, or until the apples are tender and beginning to caramelize. Watch them carefully because if they cook too long they’ll begin to lose their shape. 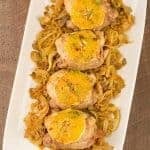 Pound the chicken breasts between 2 pieces of plastic wrap to an even thickness of about 3/8-inch. Season them with salt and pepper and dredge lightly in the flour. Heat the vegetable oil and butter in a skillet over medium-high heat. Add the chicken and cook until golden, about 3-1/2 minutes per side. 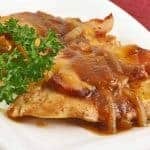 Add the bourbon and apple cider and continue cooking, turning the chicken several times, for about 3 to 4 minutes, until the sauce thickens and the chicken is no longer pink in the middle. 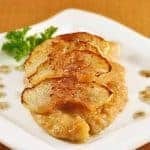 Transfer the chicken to a serving plate, top each piece with 4 wedges of roasted apple and drizzle with the pan sauce. 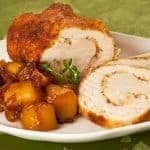 For a non-alcoholic version, increase the apple cider to 5 tablespoons and use 2 tablespoons chicken broth in place of the bourbon.